Have you ever noticed that Japanese women never put their purse on the ground? It seems like a pretty straightforward thing but it really drew my attention in Japan. 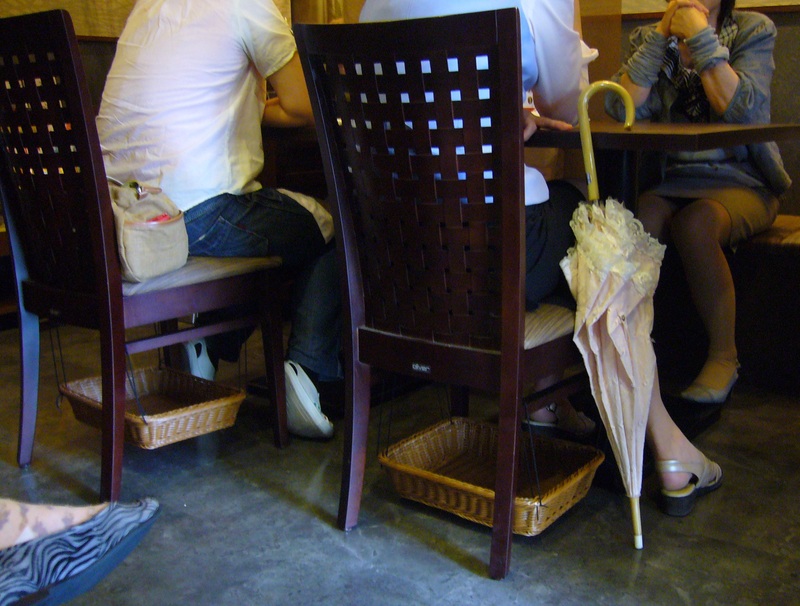 When Japanese women are in a café or restaurant, they will sit a bit forward on their chair and place their purse behind them on the chair, rather than placing it on the ground. The give up the comfort of resting against the back of the chair, to ensure their purse keeps clean. Taking into account this preference, many establishments provide special baskets for women to place their purse in. Very considerate and an excellent example of Japanese customer service. The woman on the left has placed her purse behind her on the chair. Below the chairs are suspended baskets, intended as a place to keep your purse. 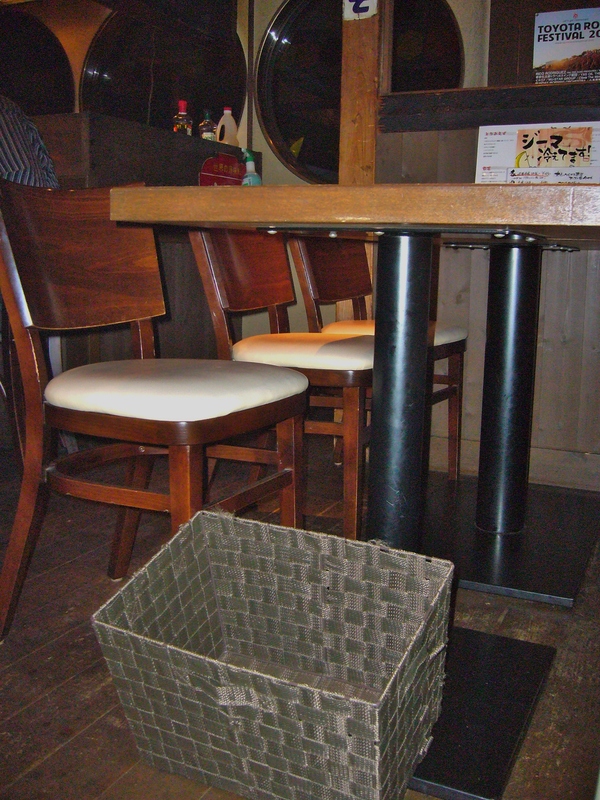 Another café where they offer a convenient basket to keep your purse off the ground. Only when I started noticing the Japanese habit of never putting their purse on the ground, did I start thinking about how Belgian women do put their purse on the ground sometimes and how dirty that actually is. Since then, I take care to never place my own purse on the ground. This Japanese purse etiquette is a good illustration of the importance of cleanliness and purity in Japanese culture. When it comes to daily habits, I find the Japanese often have very sensible views on cleanliness. After I left Japan, it took some getting used to a few ‘dirty’ Belgian habits again, like wearing shoes inside the house and shaking hands with strangers. 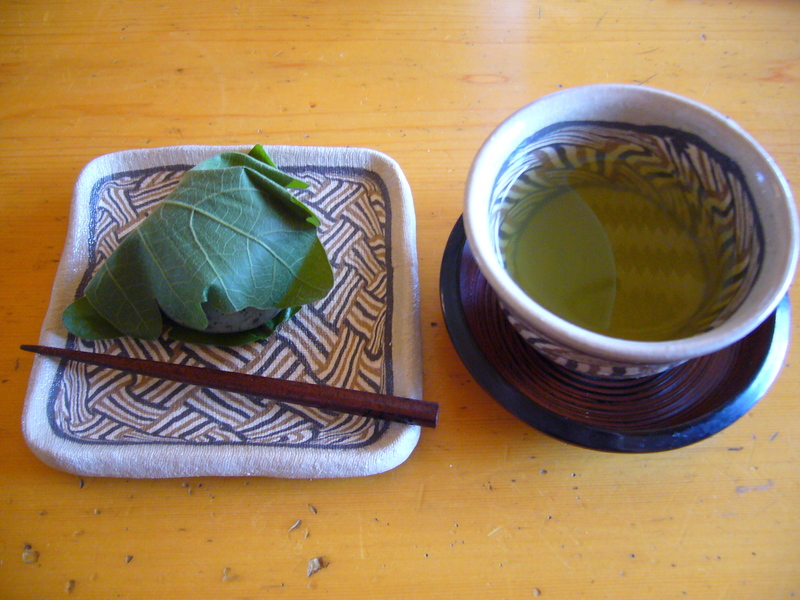 Green tea is one of the basic elements of life in Japan. I think it is safe to say that most Japanese people drink green tea every day, in one form or another. One of the most famous kinds of Japanese green tea is sencha. It is a fairly good quality of tea leaves, served to guests that visit one’s home. 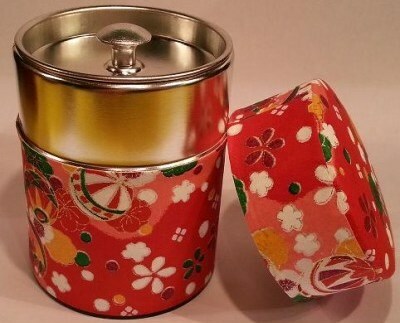 For everyday use, many people drink bancha. Similar to sencha, these are green tea leaves, but of a lesser quality. Other common types of Japanese tea are hōjicha, roasted green tea leaves, and genmaicha, green tea leaves with roasted brown rice. For a more complete overview of the most common types of tea in Japan, I refer you to japan-guide.com and japanesegreenteashops.com. Today I would like to share with you how to prepare Japanese green tea. 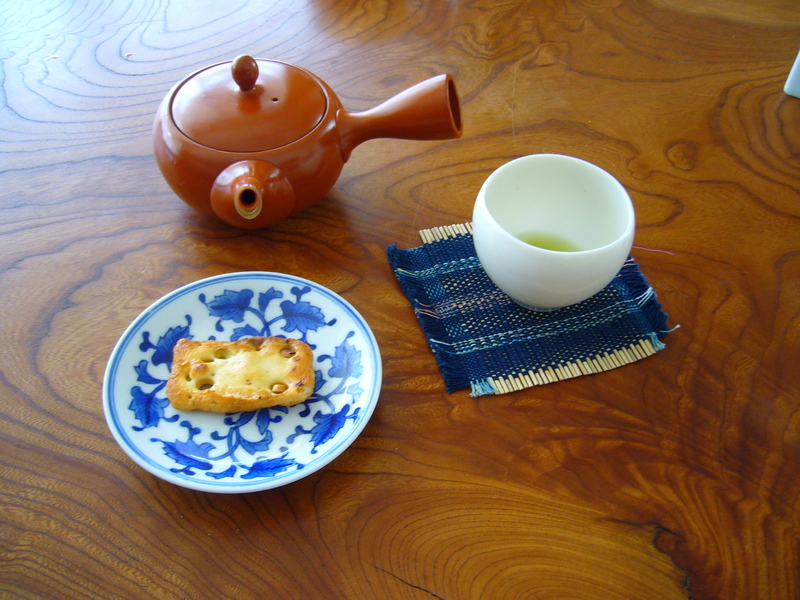 More specifically, I will explain how to prepare sencha when receiving a guest at your home. It is possible that there is more than one correct way to do this, but this particular way was taught to me by a Japanese friend from Nagoya. A teapot. Most teapots that I have seen at people’s homes were rather small, plain red earthenware teapots. But of course teapots come in all shapes and sizes. 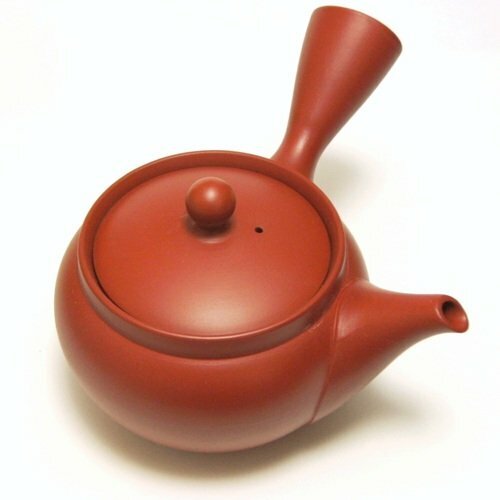 This type of teapot is called kyusu. Though the Japanese word kyusu itself simply means teapot, it often refers to side-handled clay pots like those made in the Tokoname region of Japan. 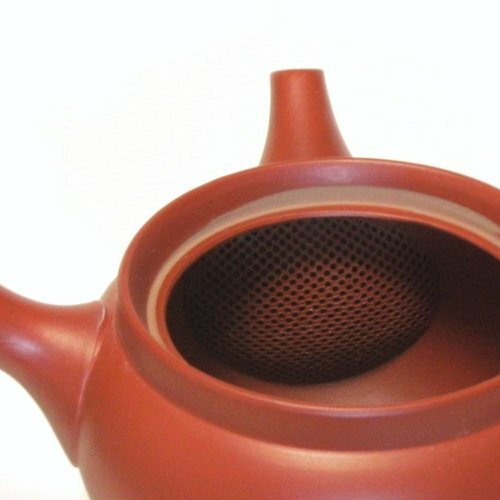 Japanese teapots include an integrated strainer, allowing the tea to steep freely and thus improving the taste. The tea leaves, in a decorative tea holder. Cups for all the guest. Sencha cups are smaller than mugs or even Western teacups. Saucers for the cups. The use of a saucer adds formality. To serve the cup without a saucer could be perceived as a bit rude. Wooden saucers can be used in all seasons. Openwork woven saucers are only for summer. If you serve cold tea, it is also best to use an openwork saucer. Instead of a saucer, you could also use some kind of coaster. A small plate with some kind of sweet for each guest, with a small fork or spoon if need be. This setup, although not exactly as I described, gives you a general idea of what I mean. Image from everyonestea.blogspot.com. This is one instance where I was served tea when visiting a friend’s home, on an afternoon in July. What a lovely and welcoming image! In the kitchen, pour the boiling water from the kettle into the tea-pot. At this point, there are no tea leaves in the tea-pot yet. The reason you are doing this in the kitchen, is to hide the kettle from your guests. Since it is very hot, your guests might burn themselves. By hiding the kettle, you show concern for your guests safety. Showing great concern for your guest’s comfort at all times is very important in Japan. Then take the tray, with the teapot and everything else on it, to your guests. In front of your guests, pour the water from the teapot into the cups. This way, the water cools further and the cups are preheated. Put the tea leaves into the teapot, about one tablespoon for each guest. Pour the water from the cups back into the tea-pot. Steep the leaves for a few minutes. Pour the tea from the tea-pot into the cups. Start by pouring a little into each cup, then go back to the first cup and pour some more into each cup. The reason you are doing this, is because the first tea out of the pot is the weakest. The tea at the bottom of the pot is stronger. It is believed that the last drop from the teapot is the best one, so make sure that the last few drops are divided over all the cups and that the tea-pot is completely emptied. Give each guest a cup and saucer, as well as a small plate with a sweet. Tea served by my calligraphy teacher when I visited her home in April. It is possible to use the same tea leaves for a second brew. For the second brew, the water should be slightly hotter. Since you can no longer use the tea-pot or the cups to transfer and cool the water, the boiling water is transferred into an extra tea-pot or water container in the kitchen and then brought to the guests, where it is poured into the tea-pot. Steep the leaves a bit longer than on the first brew, then serve the tea in the same way.